Bayanihan Race is the first-ever national running event promoting wellness and camaraderie across the Philippine archipelago. You run for fitness, you also run for the community. * No registration fee. Inclusive of singlet, race bib, timing chip, and loot bag. Upon registration, Team GK will offer hosting options to racers who will be travelling to the venue. Kindly get in touch with our Bayanihan Race Secretariat at bayanihanrace@gawadkalinga.com for assistance. Deadline of registration should be one week before the race date of the selected region. Sign up by clicking the REGISTER/JOIN NOW buttons on this website or by clicking through this link. No registration fee. 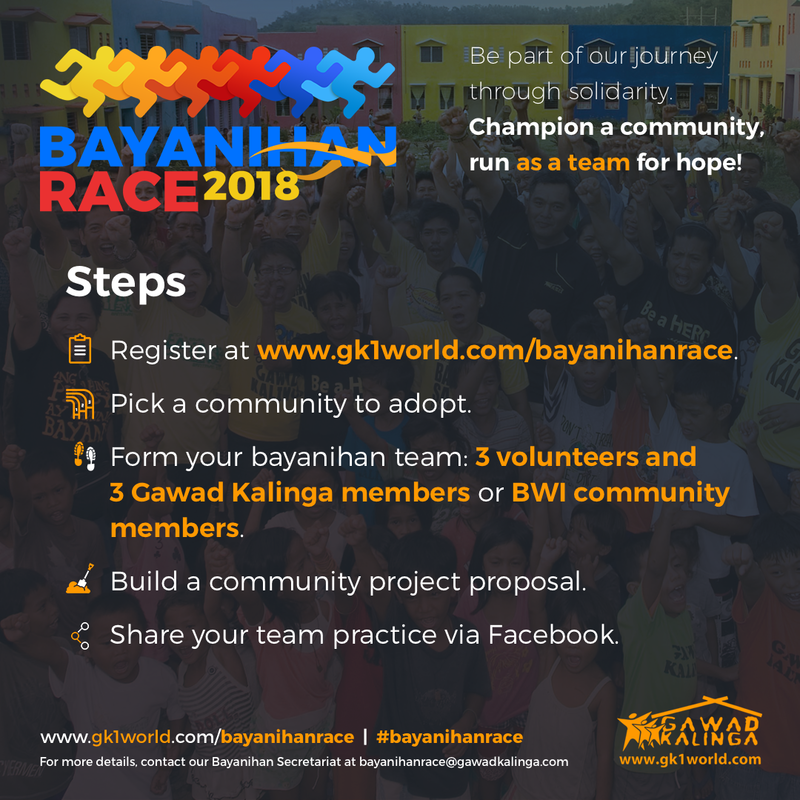 Racers should fill out online registration form and share their training sessions on Facebook/Twitter/Instagram using the hashtag #BayanihanRace. Teams without community project proposals will be disqualified.